I have a number of heroes in my life. I have heroes that have passed on long ago, never having known me physically, but somehow reach me and walk with me through life in some way. And I have heroes who have literally been by my side at the right moment and with their personalities, life stories, and work teach and inspire me more than they know. Lately, in this time of transition for me, I've been thinking and praying of all my heroes. I've written a lot about the first type, some of those who lived in seventeenth century France, one who died just a few years before I was born. But before St. Vincent de Paul, before Ita Ford, there was Rachel Scott. 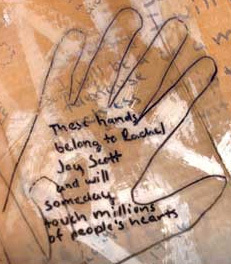 When I was in high school, I received a copy of The Journals of Rachel Scott: A Journey of Faith at Columbine High (which, by the way, aren't really her journals but writing based on her journals). Rachel and I had lots of differences but I connected with the similarities. We were Millennial high-school juniors, she being born in '81 and I in '85. We avidly journaled our thoughts, fears, and prayers. We struggled with the faith journey - the joy of finding Him, the grief of His silence, the confusion of not knowing His path. We believed, against all odds, that we could somehow change the world. With her, I felt like I had a companion on the journey. Her story pushed me to continue on as I grew deeper into figuring out life and faith and the future. It didn't matter to me whether her life ended with the "do you believe in God?" question or not. I still felt that I had a hero that taught me that people like me could change the world. As my life went on, Rachel and her story phased out of my mind. New heroes came in, accompanying me in new ways that I needed at the time. She didn't appear again until I saw on Facebook that a movie, I'm Not Ashamed, was being made about her life. At first, I was just excited that a movie was being made about one of my heroes almost twenty years after her death. But now, watching I'm Not Ashamed, I realize the movie's timing, Rachel Scott's story re-entering my life, was Providential for me. Don't pretend to be someone else just for the convenience of it. Because it's you, the true you, that will change the world. "Don't let your character change color with your environment. It's a very appropriate message for a high school student. Peer pressure, trying to figure out who you are, discovering the depths of faith and all that. But it's also a message for me now. Almost 20 years later after her death, 15 years after reading the book. The truth is, when you leave a religious community, you lose an identity. You're no longer "Sister". You're just you, a face in the crowd. But if being "Sister" was an identity that you discovered never fit you anyway, there's some soul searching to do. How do I show my faith now? And then this question appears - is "changing the world" youthful naivety? ...yet I think of those heroes in my life that I mentioned earlier - the ones who have physically been at my side. They've changed my world for the better, giving me the inspiration to do the same for others. That's changing the world. and continue to believe that one day, I will change the world.